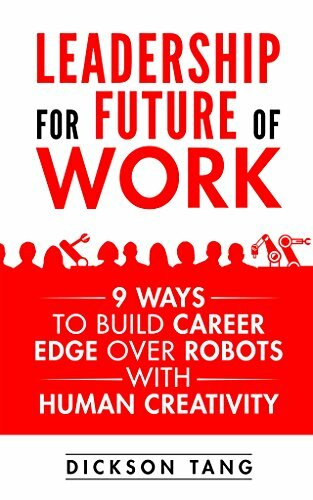 By @SimonCocking review of Leadership for future of work: 9 ways to build career edge over robots with human creativity by DicksonTang Expert: #leadership #creativity #futureofwork. Book available from Amazon here, and see the book’s website here. Are you a leader, manager, working professional or business owner worrying that one day robots will disrupt your job and business? The day is TODAY. Future of work requires a new way of leadership, with creativity a key differentiator between humans and robots in the workplace. Why? According to World Economic Forum, by year 2020, about 7.1 million jobs could be lost through automation. According to McKinsey research, almost half of the world’s current work activities will be automated by 2055 or possibly earlier. What should you do in preparation for the future? Only the paranoid survive. This book aims to be short and sweet, with keep concepts and ideas for you to consider as our changing workplace happens around us, perhaps not on a daily basis, but certainly quarter by quarter. When you account for the line spacing and the 3 to 4 page break between each chapter it all adds up to make it a quick read. I’m not sure that every chapter then needs a whole page, each for the few bullet points on key concepts, and then another one for ‘your free gifts’, as it felt a little like padding after the second time you have to skip over those two pages again. This to one side the book is interesting, insightful, and readable in a light and engaging tone. I’m not sure if robots needed to be so heavily featured in the title because this book is really very much more about the humans rather than the robots. If you are trying to future proof your own professional career then this book is worth reading, even for writers, tech journalists as well as everyone else. It was an enjoyable read, but for future versions it might be no harm to remove those near blank pages and expand on the content a little further as Tang has interesting ideas and it would be good to hear more about them. Dickson is a leadership ideas expert, focusing on how leadership will evolve in the future of work. His research, writing, speaking and workshops demonstrate how leadership and creativity can be of practical benefit to individuals, leaders and organizations who want to develop winning edges over robots and get ready for the future of work. Dickson’s expertise on leadership, creativity and future of work have earned him invitations and opportunities to work with leaders and professionals from various organizations such as Cartier, CITIC Telecom, DHL, Exterran, Hypertherm, JVC Kenwood, Mannheim Business School, Montblanc and others. He lives in Singapore, Asia.